NOT the way to live! Aikiko didn’t rush overly on her return from the far east… She needed some time to think! COULD she talk to Charles about all this without violating her oath? Was Mechagodzilla going to pop up again? Which of her possible clues should she try next? Should she DO something? What? She had… Mechagodzilla running around grabbing Exalts, a mortal cult working with a minor deity to revive component souls of the Neverborn, Cauldron-Born, whatever was going on with the Nocturnals, Charles, more possible Kaiju manses, four more possible quasi-primordials developing… She hadn’t even gotten involved in BASIC Exalted tier politics yet and she seemed to be jumping right on up to the cosmic stuff! She’d have to learn a charm or two that protected secrets! Besides… it would be nice to find the stuff that Lytek had actually hired her to look for! He wasn’t at all a bad guy and he was paying pretty well! In the Jade Pleasure Dome, Luna – the Incarnae least affected by the Games of Divinity – was in the lead on considering other matters… The Nocturnals had… never actually been created as far as she knew, yet they were here anyway – with no trace of the forces that creating them should have unleashed. And someone had… somehow doubled up the number of the Celestial Exalted, a project that… should have been impossible. She might contain a multitude – but not even she contained infinity. The boundaries about the tree of possibility that she had carved out in the beginning, held secure by the pattern-exclusions of the Loom… could they be narrowing? Had someone outside of fate pierced the ancient barriers? What were they doing NOW? It was time to manifest some avatars, and once more walk the world. In Aden the refugee rescue efforts had been continuing – and a substantial number of them were looking forward to colonization… Aden was just too… full of strangeness, culture shock, and powerful creatures for most humans to really be comfortable in it, no matter what the benefits were. The Kickaha too were growing in numbers – and beginning to get rather… territorial, at least with respect to their own packs. While there WAS a lot of space in Aden, it certainly wasn’t infinite. The eagerness to induct more youngsters as full members of the packs was fading – and contention loomed. Fortunately, the warring human ethnic groups were being kept apart – and strictly monitored – by the Baalgrogs and Kickaha and other Citizens. Anyone who INSISTED on visiting their traditional opponents and making trouble was simply being shipped off to become mandatory early colonists… It wasn’t like it was easy to get hurt in Aden anyway. Anything that could get around the Guardians – such as meddling with Charles’s internal geomancy – would be pretty hard to stop. Charles made a note to add more defenses for his geomancy anyway. For good or ill, Charles still had no defenses against perhaps the simplest attack of all… “Do what I want or I will HURT LOTS OF PEOPLE! REALLY BADLY! Ha-Ha! Ha-Ha!” – or even “If you give me what I want I will give you these CUTE HAPPY FERRETS (or puppies, or whatever)…!”. Eventually someone was going to stop peering into the clouds of obfuscation and look at the utterly obvious way he could be dragged off course by a smaller child crying… Still, that was one of the things that made him horribly hard to predict. Who knew which way he’d go next? He might react to any form of distress; fuzzy or cute things were only the most blatant. Charles found that quite cheering! Certainly it was a small thing – but it was showing some initiative, and some desire to take care of themselves… They WOULD learn to be people instead of pets eventually! And – in the meantime – they were still really REALLY cute and fuzzy! Of course, that drew his attention to the fact that… there had been quite a lot more purchases of youngsters from the Raksha – and not just from the freehold in Atlanta. The Raksha liked stuff that they could show off, minor artifacts, items that hid their freeholds from mortal eyes, and goods that facilitated travel between Wyld zones – all things that Charles’s representatives were more than willing to provide. Quite a few of the purchases were equally oddly mutated – but the procedures had been set up, and even somewhat refined by trying variations on what worked especially well. The sorting into trainees, minor “employees”, and – sadly – pets had continued – and as long as they were mostly content, things were fine. Perhaps sadly, the weakest willed kids seemed fond of whatever mutations they had at the moment. The most notable grouping was a collection of kids who had been collected by an aquatic freehold. 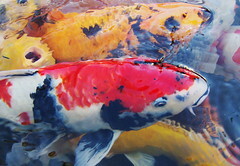 They had scales, fish eyes, and vibrant color patterns – and seemed to have been trained to be decorative carp. They liked to swim around in artificial pools and lakes, eat other fish, and eat worms and things. Ew! Oh, they couldn’t possibly… Aargh! Some of them were even willing to bite on hooks! The weakest willed of the bunch, who took most easily to the “training.” And they could only live out of water for short periods! Not more than a few hours! Elzeard would NOT have much patience with THAT. He fixed THAT first! Good grief. There was one with a hole in his or her (it was hard to tell) lip that looked like it might have been from a hook. Yeah. Right. “Yummy Worm”. The “fish” training was REALLY shining through with this one! Ergh! Hopefully “Coral” and “Flotsam” were just in someone’s private fishtank or sold elsewhere, not… pulled out and left to die or served for dinner! Charles sighed… evidently even the Raksha had a hard time coming up with anything useful to do with kids defective enough to have the minimum possible will… Thus using them as a part of repetitive amusements such as catch-and-release fishing. At least in the freehold, they apparently DID usually get some treats – but this time it hadn’t quite worked out that way. Well, otterlings were cute enough – and they could get out of the water, and have cooked food, and so on! Wait. Was this kind of… defectiveness… at all hereditary? Elzeard recommended tinkering with their hormone production to keep them… perpetual kids, applying a few mutations so that they’d never actually reach puberty. Ugh. He didn’t want people taking advantage of them, and he didn’t want them breeding, and he didn’t want to make a regeneration-exception to allow sterilization either… Was perpetual pre-puberty the way to go? Was there really any difference between that and just… mutating them to be unsexed? Charles tried asking the Kickaha; they were usually pretty practical and they did quite a lot of the looking-after anyway… After being briefed, they voted for unsexing. After all, they WERE in the “pet” category anyway! That… was rather more practical than Charles really liked – but nobody seemed to have any BETTER ideas about what to do. At least the mutations would be stable for the moment and easily reversible later – and there might not really BE a truly good solution. Oh well. Evidently there weren’t going to be any suggestions from them. He made the changes – and left most of them saying “What? Did you do something?”. They… pretty obviously wouldn’t protest even when they noticed. That was REALLY SAD – and it made him feel… rather dirty. Charles went to have a bath and do some rescue work. That would help! Methinks Luna is about to pay Charles a visit. This should be interesting. An idea that could help Aden that just now popped into my head: improving his image. In a sense, some public relations. Gaia’s Kami are semi-regular appearances around Yu-Shan, in that thier presence is expected and routine. If some of the Guardians were to be seen interacting in a friendly manner with the Dragons it might do well for his public image. Plus if Gaia thinks well of him, then that greatly increases the chances of a favorable first impression with Luna. Well, the Guardians haven’t (at least to the best of Charles’s knowledge) been out in Yu-Shan much. He suspects that having strange Deva’s wandering about might cause considerable upheaval. Still, what with the number of deiphages wandering about, that’s probably a lot less of a problem than he currently believes (he reached his conclusions on the topic while he was still a lot more sheltered from the deiphage problem, and hasn’t had the topic brought to his attention again since). That is something that his Guardians might get up to on their own initiative though. It is pretty likely – but Charles is in a frantic rush compared to the Gods, so it may not be for some sessions to come.